High Rise Window Cleaning at it's finest Virginia Beach. How would you like an estimate on the best pressure washing to your building's dirty facade? We do it all, but that's certainly not all we do! ​Dear Virginia Beach, VA high rise window cleaner seeking property owner, SMILE! ​Over the years my team and I have professionally cleaned literally hundreds of thousands of high rise windows, siding, gutters, ceilings, and otherwise dirty exterior FAÇADES. Whether you're a homeowner, manage a property, or are a commercial or industrial property manager of a high rise building... when you hire us? It's all hands on deck. More importantly we are at the top of Google for the reason being that we are the best at what we do, high rise window cleaning that is.. However you likely could care less, so let's talk about YOU. You've got a house, a building, a business. This property has windows and siding and, roof. And they are all dirty, your facade is looking a little drab, windows hard to see through and the roof covered in bird poop. Am I getting warm yet? ​Maybe you've got the persistent door-to-door salesman's grime, or graffiti, or some fried ants on the sidewalk. Maybe you just like being as OCD as I am when it comes to having nice things and it's time for a clean fresh look to your high rise building(s), business or home. You just want to have clean windows and brilliantly clean facade again. And to be able to enjoy the view you worked so hard for. But it needs to not only be flawless, but functional in that it needs to hold up to the unforgiving VA Beach sunshine. If I am... and you want the very best window cleaning pros in Virginia Beach, Virginia metro area... who'm are fun, yet professional, easy to work with guys and gals, and will treat your building like a form of art? Stop reading and give us a call. We can be reached at: (757) 707-8111. We're super excited to show you why we're the #1 window cleaning company in Virginia Beach, VA. Residential, commercial, window cleaning, gutter cleaning, pressure washing, holiday lighting for your property, bird proofing (yup we do that too! ), parking lot or grounds maintenance, or other? 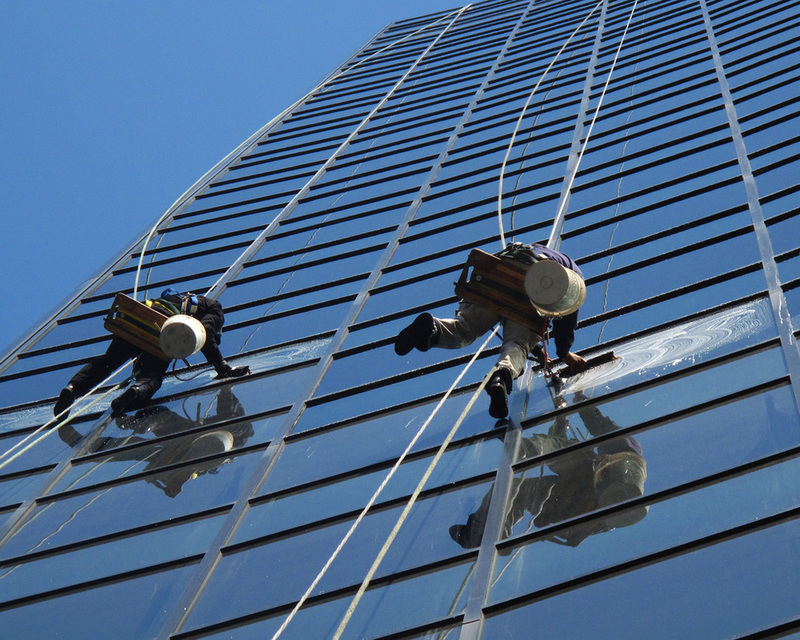 Welcome to Virginia Beach’s #1 high rise commercial window washing, pressure washing, and glass maintenance specializing in high rise buildings! Read on to learn about our services, free tips, and what sets us apart as the best window cleaning company in Virginia! ​Virginia Beach is a beautiful sunny place to live but when it rains it pours. While Va beach is still beautiful when wet the rain and hurricane season can do a good number to your windows and building. 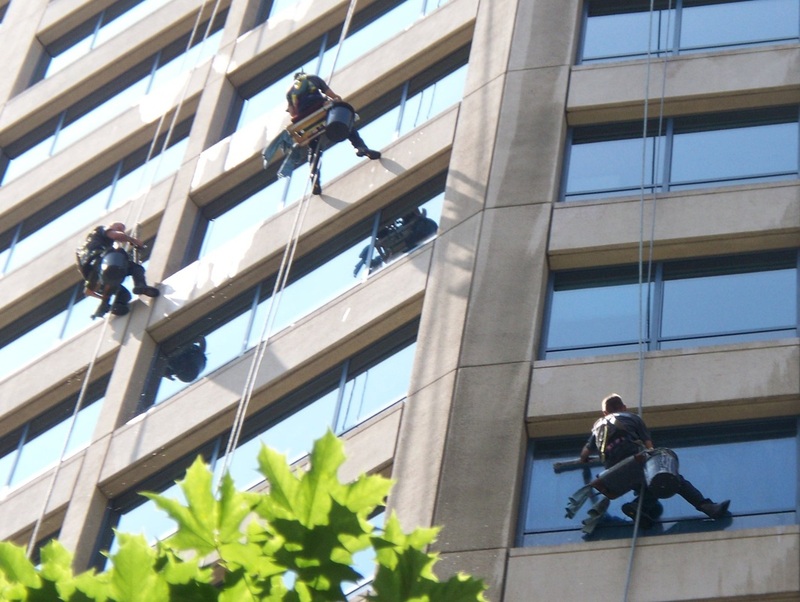 ​Things like, "High Rise Window Washing," and "Pressure Washing" are becoming more frequent searches but High Rise Window Pros will continue to be here to take care of your building no matter how big or small. In fact, we are the only company in the entire state of Virginia that will pressure wash a high rise building, other guys wont touch them! The weather here in Virginia Beach leaves property managers and home owners alike faced with a multitude of tedious window chores when it comes to having spot-free glass exterior. Sound familiar? To the hardest working staff, it's what's on the outside that counts—on the outside of buildings that is. Their fully licensed and experienced technicians dispatch to clients' businesses and homes, scouring panels of glass and power washing screens to remove dust, debris, feathers, tree sap, and... eggshells. In addition to cleaning glass, they also power-wash façades, porches, roofs, and menacing gargoyle statues with delightfully satisfying results. ​Virginia Beach window washing companies promise the world, but how exactly are you to trust them with your property you ask? High Rise Window Pros and their amazing team specialize in high-rise and skyscraper window services in Virginia, buildings and homes of all shapes and sizes can benefit from the company's years of expertise. ​To ensure everyone can truly enjoy the beauty of their neighborhood, we offer both interior and exterior window cleaning techniques that never leave behind streaks, marks, smudges, tracks or silly face-prints. ​And, unlike those other more expensive, less good-looking window cleaners, and pressure washers in Virginia Beach, we even clean window screens, using an effective power washing method that won't leave behind dust and dirt the way dry brushing can. See, we bring our A game to every job and don’t just make promises; we deliver results that keeps our clients calling us again year after year. With a variety of cleaning services to include glass, metal, and various different facades we promise your curb appeal will get a boost when you choose us as your window cleaning and pressure washing service in Virginia Beach for your high rise or commercial building! Our fully-insured operation also guarantees our work and takes care of any headaches arising from an extremely unlikely and embarrassing collision with Spider-Man. ​When they’re on the job, High Rise Window Pros offer guaranteed results in restoring tarnished exteriors to spotless states with a comprehensive collection of cleaning and protective services. This is why the good folks of Virginia Beach have been hailing High Rise Window Pros as the best commercial pressure washing and high rise window cleaning company in Virginia for many years. The company’s experienced technicians release windows of dirt and smudges by hand, employing squeegees to polish out-of-reach panes in an Eco-friendly and safe manner that will make your property shine. Too much unfettered sunshine? Windows can also benefit from an optically clear tint window service that our technicians can apply in a variety of shades to repel damaging UV rays and protect interiors from fading, heat, and glare. When you put your trust and property in our hands we treat you like family, your property is our number one priority with a 100% satisfaction guarantee! Let us earn your business! More Than Just A Pretty Façade! Perhaps books cannot be judged by their covers, but businesses are certainly judged by their appearance. Proper window cleaning and maintenance on a regular basis is a major key to upholding the curb appeal and professional image of your business. ​Yeah, sure we skillfully clean the tallest and pointiest buildings in Virginia with such sparkle and shine it’s earned us the title as the best window cleaning company around, but we are proud to offer a complete suite of window cleaning services in Virginia in addition to just the basics. The rain and humidity that blankets the Virginia Beach area can pose a unique challenge to property managers and homeowners, with dingy moss growing on rooftops, unsightly mildew accumulating around windows, and hungry trolls amassing in gutters. ​The local experts at High Rise Window Pros have seen it all, and possess a formidable toolbox of techniques that rid buildings and walkways of moisture-related irritants. To achieve clean, fuzz-free roofs, the team employs an eco-friendly, EPA-compliant window treatment spray to kill moss quickly without harming the surrounding environment. Attempting to clean your gutters while teetering on the top of tall ladder or on the back of a basketball player can be dangerous and time consuming. Our professional Gutter-cleaning services keep gutters free of leaves, twigs, and reindeer droppings that can build up and freeze in winter months, causing real damage. ​Technicians remove these potential clogging agents so that water flows freely. A multi-point inspection is then performed to determine the state of each gutter, ensuring complete satisfaction. Over time, the exteriors of homes, offices, and virtually all kinds of buildings are prone to accumulating grime, dirt, cobwebs, graffiti, and persistent door-to-door salesmen – all of which can be easily removed with a simple and effective pressure washing treatment. ​Restore the curb appeal and brightness of your building’s exterior and improve the image of your neighborhood, business, and home. We also deliver a popular concrete cleaning service that completely removes grease, oil, chewing gum, chalk, fried ants, and other stains from sidewalks, driveways, and walkways. Our team of pressure washers/window cleaners in Virginia Beach is delighted every day to do what they do best – (and trust us – they ARE the best at what they do) to make your property our #1 priority. We pay special attention to long-term quality, and are proud to deliver solutions that last. When we pair our core values with our commitment to great service, customer satisfaction isn’t just a goal… It’s a guarantee, and one we’re proud of. With industry-leading expertise in high-rise, residential, and commercial services, High Rise Window Pros are proud to bring out the best in your property. You can trust our family to take the very best care of your home or business!